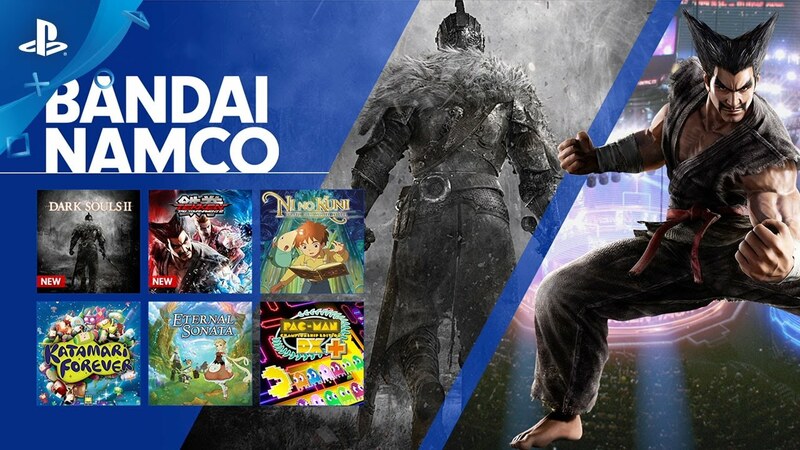 Beginning today, PlayStation Now subscribers can enjoy even more of Bandai Namco’s biggest franchises. Experience FromSoftware’s hit RPG Dark Souls II and explore the dangerous world of Drangleic. Or pick your favorite fighters and go head-to-head in Tekken Tag Tournament 2. Also new this month are Namco Museum Essentials (Pac-Man, Xevious, Galaga, DigDug, Dragon Spirit, and Xevious Resurrection), as well as Dead to Rights: Retribution. Don’t forget to check out our other Bandai Namco games already available including fantastic RPGs like Ni no Kuni: Wrath of the White Witch and Eternal Sonata. And consider timeless classics like Katamari Forever, Pac-Man Championship Edition DX, and Galaga Legions DX. Besides Tekken Tag Tournament 2, PlayStation Now also has a strong line-up of heavy-hitting fighting games like Mortal Kombat, Ultra Street Fighter IV, Injustice: Gods Among Us, Street Fighter III 3rd Strike, WWE 2K15, Dead or Alive 5 Last Round, Guilty Gear Xrd Revelator, Darkstalkers Resurrection, The King of Fighters XIII, BlazBlue, Virtua Fighter 5, and many more, with versus multiplayer support. If you’re an RPG and JRPG fan, we’ve got you covered with even more games like XCOM Enemy Within, The Legend of Heroes: Trails of Cold Steel 1 and 2, Disgaea 3, Disgaea 4, Disgaea D2, Rainbow Moon, Costume Quest 2, Dragon Fin Soup, Legasista, The Witch and the Hundred Knight, and more! If you’re not a PS Now subscriber yet, check out these games and more with the seven-day free trial. You can also take advantage of our introductory pricing of just $9.99 for the first month (new subscribers only), or upgrade your subscription with another 12 months for $99.99, for a few more days. Take advantage of these deals before the promotion ends! Where the heck is Demon’s Souls or Dark Souls? How can a Sony IP (Demon’s Souls) not get access on PS Now? I’m praying this is bc From is remastering both for ps4!!! Wow nice surprise with no fanfare; good chance for me to finally give one of these games a try. If I was a kid I’d be jumping up and down. I remember when I was excited for Gamestop Buy 2 Get 1 and Buy 2 get 2 free deals with the 10%. Renting games was like $6 for 2-3 days worth of renting. You can have an entire library of streaming games for almost no cost. On Live was a cool concept but there was no way I was paying full price for access to games. All I ended up doing with my On Live beta was watch people play Shatter and a couple other games. XD. I personally feel like PS Now doesn’t get any of the fanfare it deserves. From what I’ve tried from my beta playing. I remember going to Crown Hotels and you paid like $6 to play Super Mario Brothers for a couple of hours. That’s all without counting inflation. But if PS Now isn’t the service for you, you still have Gamefly. It’s not perfect, it’s not the most appreciated service, but if people really think about how much you get for the cost, it’s pretty dang awesome IMO. I just wish I had the internet to use it so I could play the RPGs without having my PS3 hooked up. All your saves get automatically uploaded to the cloud. I play across my PS4 and PC all the time. Thanks! Purchased, and so far so good! Why did you guys remove the Assassins Creed games? I was planning on eventually playing through Rogue since I never played it before. I’d also love to see Final Fantasy 13 and both sequels on PS Now sometime in the future. My best guess is they purposely did that to improve the sales of the PS4 remaster. I know right, I was 2 trophies away from Assassin Creed III Platinum, what gives? I tried using PS Now on my PS3 Slim and PS3 Super Slim but had some issues. Both consoles are connected wired and have I an speed of 150Mbps. I tried playing God of War 3. On the Slim, I was able to load the game but it kept on disconnecting me. On the Super Slim, I was unable to log the game. When I clicked on it, it just kept on saying checking (I forgot the rest of the message). I let it run for a while but it never loaded. When I check on the game, I see a count down timer and I see it under my services section, which means, according to the system, I used it. But it never loaded. I tried this on both consoles several months apart under two different PSN ID. Also, in both cases, when I close PS Now, it restarts my PS3. Do anyone else have this issue? I noticed that Sony removed PS3 (and PS Vita) from the PS Now information on the site (it just has PS4 and PC) so I am guessing something is going on. I’m sorry to hear you’re having trouble! That’s a pretty specific question. I suggest you try our support forums over at http://community.us.playstation.com/t5/PlayStation-Now/bd-p/PSNow and hopefully our support team can help you resolve that. I was just about to post what he said…. I would also make note of your connection speed. While ‘wired’ is better, you still need to have about “juice”. Very nice to see Tekken Tag 2 there.Hope more people can experience the best Tekken ever. Thanks, Welmosca! Yeah, this was an awesome addition to our PS Now fighting game lineup. When will PlayStation All-Stars be on PS Now? Also, when will we get a sequel? Very underrated brawler. A few missing key PlayStation characters like Solid Snake and Cloud and it’d be golden. Really happy with the addition of Dark Souls 2 but not happy with the Assassin Creed games getting removed. Does this mean that Ubisoft felt that they weren’t making enough profit from PSNow? Final Fantasy XIII-2 was removed about a year ago as well and has not made it back. I think the lesson being learned here is to not get rid of your PS3 if you want to play the games you want when ever you want. Thanks for Dark Souls 2. I am looking forward to play this game on my Vita. I hope, I will see in future some other good Namco games, like Tales of series or Majin and the Forsaken Kingdom. It only says playable on PS4/PC are you sure they are Vita compatible? yes i’m playing PS now on Vita most of time. When do these games come in europe, bc my friend in America has it all ready and i don’t have it, btw i live in Holland. Tekken Tag 2 might get a play to wet my mouth before getting T7. The wording of “PS4/PC” has caught the eye other others, and I hope access to the service will not be limited on the PS3. Would be nice to continue using the service on the system majority of the games are coming from. I too am looking for the store update for this week too. they have been late recently, and I’ve been blaming the holiday. @jdizzle0420 Or how about an even better question. Whatever happened to fixing the app? There’s still live streamers (I know a couple) that still uses both The Playroom and the PlayStation app to live stream their shows that demand Sony to fix the app. I want Sony to fix the app so I can do a live stream show (using both The Playroom and the PlayStation app) dedicated to old school games once I get fiber optic internet. Now that’s what I’m talking about Playstation! Great additions to the lineup! When will these be coming to the UK\Europe? PS Now is a great service. I enjoy it very much but the price for $99 for a year is too much. At least to put down all at once. Why don’t you keep the $10 every month? So I that way if Im not gonna use the service for that month, I will not purchase it. But then return to it the following month. If I do keep it for a year, Sony made more money than $99 at that point. Just an idea!! FOR YEARS we’ve been asking for demons soul sister or dark souls on the vita and now that psnow is here, where the hell are they? You bring us arguably the worst souls game in the series..do you think we will forget about the other games. Sony i’ve been with you guys since the orignal PS, since the orignal MGS demo on pizzahut, guys bring back good Crash, bring back the classic, ridge racer, tekken, crash, medievil, the classics that made this great. ps plus needs to be improved, consolidate ps plus with ps now, it should have been BC to begin with!. its a slap in the face to us original owners. Can someone please tell me when we are finally getting Star Wars Force Unleashed on this thing? Honestly the only thing keeping me from using PS Now is the fact that the game I really would like to play they do not have..
Is it coming anytime soon? Are the people managing Ps Now even trying to make a deal together to get it in soon? Would appreciate some answers. I would really like to see Need for Speed 2012 added to playstation now. I would like to see Need for Speed Most Wanted 2012 added to playstation now, I loved that game on ps3. Would love to see Okami back on the list. Never was able to play it and don’t have the money to get a PS3, I have a PS4 tho, and would gladly pay for a subscription to play it. Do you guys have any European Country release road map?! When Demon’s Souls will be available in PS NOW?! WHEN?! Just give me answer!!! Could PS Now subscribers get some splinter cell games from Ubisoft put on the service? Also, how about some Hard Corps Uprising from Konami? Better yet, could Sony put a wishlist of games PS Now subscribers would want on the service as a new feature of the service? Can you guys make clear, easy to parse posts? Two lists: “Games Added to PS Now” and “Games Removed from PS Now”. It’d make things much easier. Will more Bravia TVs be added to the compatibility list? Could you please add Harvest Moon and Save the Homeland to PlayStation Now. PlayStation Now is a great idea as there are no gaming rentals left in my city. There are lots of games to chose from on PS Now, but they are mostly B titles, so this should dictate the monthly price. $9.99 per month would be fair. Thank you for a good service. I see, Tales of Zestiria and enhanced version of Dark Souls 2 was added to service. That is great! Thanks very much. Can you get NieR on here? I’ll happily subscribe for that.